Search for your favorite songs by title or by original artist who made a song popular. Browse our library of available singles by BPM (beats per minute), suggested activity, or music style. Preview each song before and after you add it to your playlist. Add or delete songs from your playlist as well as change the order of your songs in your custom playlist. Preview the transition or "mix" between songs in your playlist. Change the BPMs for the songs in your custom playlist (limited to 15 BPM decrease or 35 BPM increase). Download your custom album and import into iTunesTM for use on your computer, AppleTM device or burn onto a CD for you to take and play on a stereo system. Here are some of the questions we frequently encounter. If you have any questions which we have not answered for you here, please use the box below to send your question to us and a representative will respond as quickly as possible. 2. How long will it take before I can download my custom mix? Numerous factors can affect the processing time for your custom mix. The time of day, number of site visitors and volume of custom album requests at any given time will all have an impact on the length of time it takes for your album to be completed. We estimate that for every two (2) songs you can expect five (5) minutes for processing. So, an album of 12 songs should take approximately 30 minutes before it is ready for you to download. 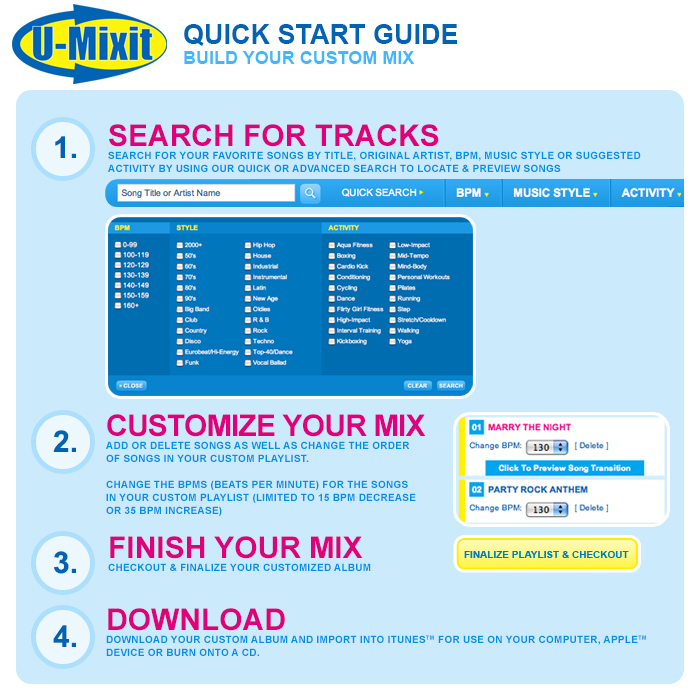 To access your download(s), visit www.U-Mixit.com , login to your account under Member Services and then click on the link for "View Download History". As soon as your custom album is complete and your files are ready for downloading, the status of your album will be updated from "PROCESSING" to "DOWNLOAD NOW". The time of day, number of site visitors, the speed of your computer, the speed of your internet connection and the speed of your internet service provider will all affect the time it takes for you to download your album from our site. Most albums of 10-15 songs will be able take between 10 and 30 minutes to be downloaded from our site. Music purchased from U-Mixit cannot be returned or exchanged. We are confident with the preview functions for both the songs and the playlist transitions that you will be thrilled with your music purchase. If an album that you purchase and download is defective in some way you must contact us within 48 hours of your purchase for audio file replacement. 4. Do I have to pay a licensing fee to use U-mixit music? You do not need to pay any licensing fee to use our music for your own private entertainment; we have paid for the right to sell the recording you have purchased from us. However, if the music you purchased from us will be played in a public location (fitness center, health club, school, church, hospital, and other public or private facilities) then the facility (or you) must pay for the right to play publicly protected musical works. A blanket license from ASCAP, BMI, and SESAC is required for this. If you work for a facility where these licenses have already been obtained, then you are not personally responsible for obtaining them for your classes. 5. Why don't you use all original artists? Most popular artists, if they are available to us at all, often demand fees that would require us to raise our prices beyond an affordable level. Also, many original versions of songs do not have 32 count musical phrasing or are not at a desired BPM for fitness activities. There are a number of factors that affect the pricing of music on our site as well. In addition to paying our producers to remake songs for our library, we also must obtain a license and pay a fee to the song writer(s) for the use of each and every song itself regardless of the recording artist. Please fill out our customer service request form to help us better answer your question. You may also call Customer Service at 1-800-843-6499 or via fax at 443-378-5123.